ETA Matt Stone Jr from West Palm Beach, Florida. Photo Credit: Jim Stossel. I wish to thank Matt Stone Sr for contacting me about his talented son, ETA Matt Stone Jr. At just 15, Matt successfully balances performing and volunteering with his responsibilities as a full-time high school student. 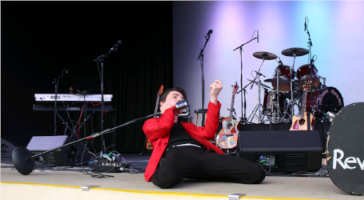 Matt recently competed in the Lake George Elvis Festival, entertaining the judges and audience alike with his energetic performance and ease on stage as seen in the video that is posted following Matt’s bio. It is my pleasure to introduce ETA Matt Stone to SIDEBURNS Magazine—a young man with a very bright future. C.M. Photo credit for the above slideshow : Jim Stossel. ETA Matt Stone. Photo Credit: Matt Stone Sr.
Matt Stone Jr is a young ETA from West Palm Beach, Florida. The 15 year old Park Vista Community High School student is a guitarist in Park Vista's Jazz Band. In addition to singing and playing the guitar, Matt also plays the drums and percussion instruments. Musically inclined, Matt sees his future as a session musician or working behind the scenes in the music industry. An ETA for just three years, Matt credits the start of his love for Elvis to John Stamos the “Full House” actor who, as character Uncle Jesse, not only expressed his love for Elvis on the show, but also impersonated the King in one favourite episode—jumpsuit and all. Watching Uncle Jesse’s performance of “Jail House Rock” led to watching the Elvis movie of the same name, and from there he started singing songs and studying videos to adopt the Elvis persona he saw on the show. Matt likes the heart and soul of Elvis’s music, something he feels is lacking in today’s machine and auto tune music. He feels like he's bringing good music to a new generation when he plays Elvis and other older music. Matt comes from a musical family. Matt’s dad, Matt Stone Sr, taught his son how to play the guitar and gave Matt his first guitar at age 4. Matt’s has some vintage guitars once owned by his grandfather, who was also a guitar player. Photo credit for photos in the carousel: Matt Stone Sr.
Matt has a weekly gig at a local venue in West Palm Beach, but also volunteers to perform his Elvis tribute act at senior-living facilities two to three times per month. He is seen by staff as an amazing, talented, and poised young man who does a really good job. Matt’s other charity work includes a recent show for the Peggy Adams Animal Rescue League. Matt Stone Sr, who is a detective with the Palm Beach Sheriff’s office, is rightfully proud of his son. "I couldn't be more proud because he's genuine; he's not arrogant and gets good grades, and knows right from wrong. I couldn't ask for more. I'm very blessed and want to help him on his journey. He has all the ambition," Matthew Stone said in the Sun Sentinel article, May 1st, 2018. Matt Sr also shared that not only does his son look and perform like Elvis Presley, he is an encyclopedia and historian (on the topic of Elvis). Matt is indeed ambitious. He tried out for "America's Got Talent" last January, and wants to try out for "American Idol" when he turns 16. And to take part in the Elvis competition in Lake George, NY in June, 2018, Matt set up a GoFundMe page to help raise money for his trip to the festival. Everyone one at SIDEBURNS wishes Matt very best wishes with future competitions and plans. Thank you for sharing your ETA story and great photos. Information based on an article posted in the Sun Sentinel, May 1st, 2018. Edited for this article/bio by Carolyn MacArthur, Editor, SIDEBURNS Magazine. 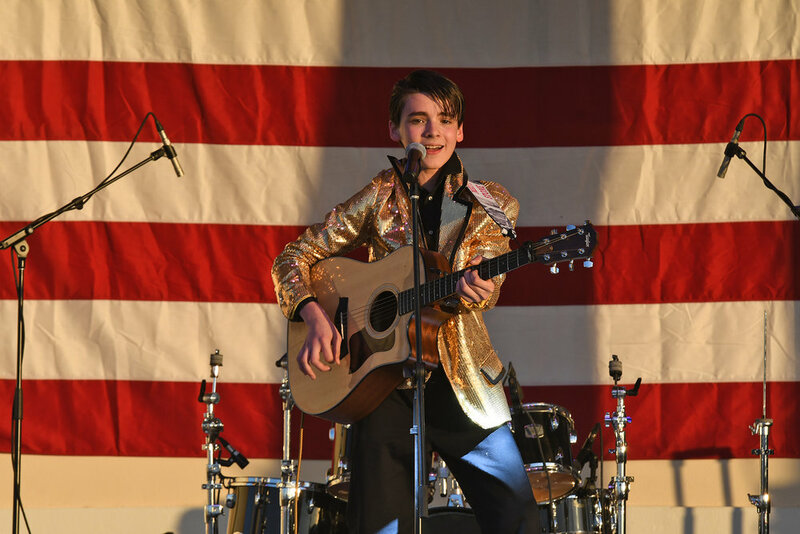 Young Elvis Tribute Artist Matt Stone Puts Heart and Soul in his Performances, July 18, 2018, Wellington Insider. 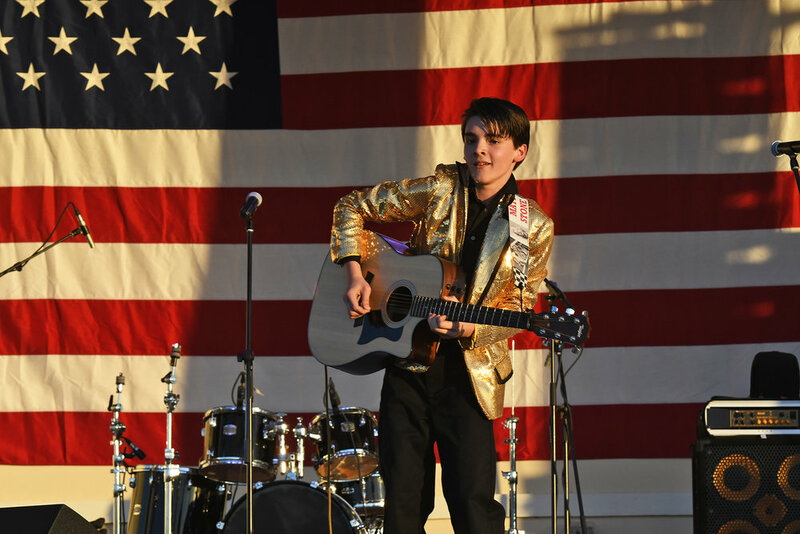 Elvis Presley: Lake Worth Teen Keeps the Iconic Musician Alive by J. Poletti, August 16, 2017, Palm Beach Post.